I have a confession to make, which will shock the purists amongst you. I have done today’s walk out of order! 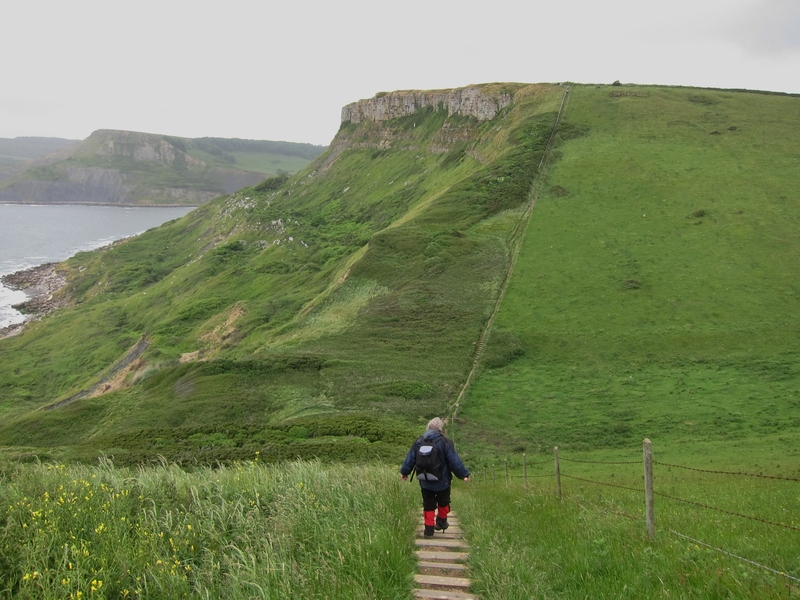 The original plan was to go back to Bournemouth on the train and walk to Swanage, but as I was showing the maps to Liz, Jane and Vicki, my walking companions of old, I let slip that the following section, Swanage to Kimmeridge, would be prettier. Liz suggested that we do that first, as not all of them will want to walk tomorrow. There was a stunned silence as the others saw my horrified face – walk out of turn? How could I possibly do that? My whole scheme would go to pot! However, after I had had a snort (or two) of brandy and been patted on the back I thought about it and decided that I need to get grip on these OCD tendencies before I turn into one of thos e people who constantly wash their hands and run home to check if they have left the gas on. I took a deep breath and agreed. In return, I bargained for setting off at 9am. We are staying in a very nice hotel, The Pines, above Swanage which gives straight onto the South West Coast path. 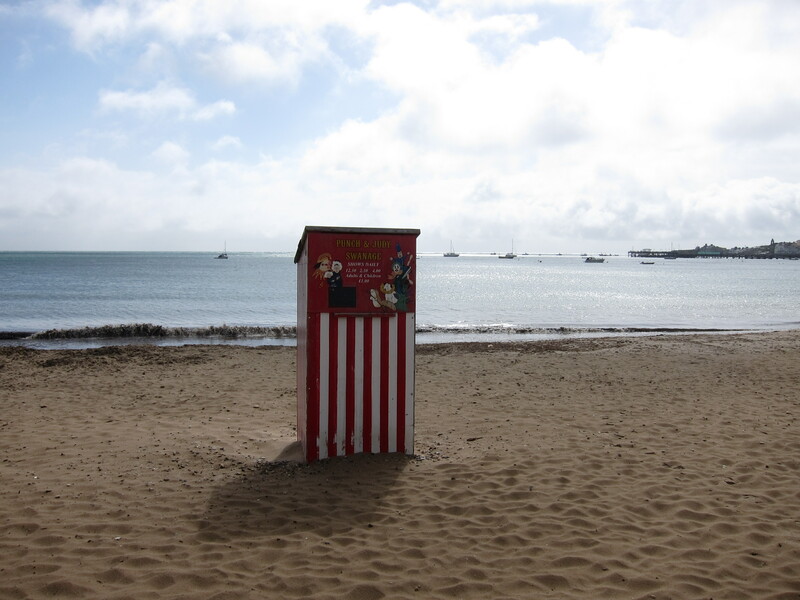 We meandered through the town, stopping to chuckle at the Punch & Judy booth and admire the boats bobbing on the fairly stiff waves. The sun had come out after a very wet night, but the wind was still fierce. Just out of Swanage is Peverill Head. A wonderful vantage point from which the needles at Studland, and the sweep of the whole bay is visible with the various headlands stretching west also visible. 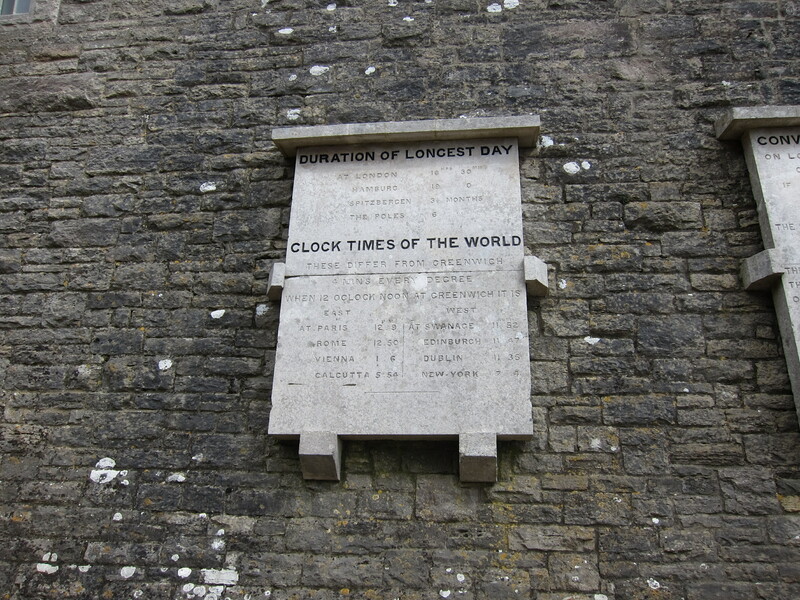 This was followed by Durlston Point where there are all sorts of informative displays about the development of the earth and the time and tides although we were flummoxed by the information on the convexity of the earth. The wild flowers were an absolute delight – valerian, thrift, buttercups and yarrow everywhere. We travelled gently along, stopping for photos and to admire the view. A fellow walker pointed out some puffins bobbing on the waves, but I could not see them. There were traces of Purbeck marble quarrying everywhere, with old mine adits and scary caves with narrow columns that did not seem strong enough to support the cliffs above them. To say the walk was undula ting would not do it justice. We passed the light house at Durston and the Coast watch at St Aldhelm’s Head, but did not stop to look in the chapel (Vicki and I having been their previously on our one and only attempt at camping – my psyche still bears the scars.) There are a couple of ridiculously steep drops down with almost vertical climbs back up that had the wind whistling through our lungs. The countryside is superb, with beautiful Purbeck stone dry walls and pretty farm houses. Even the cows were picturesque Jersey rather than grumpy Friesians. After an unintended detour to Chapman’s Pool, we got back on the path, only to find that it was closed between that point and Kimmeridge. Some young lads had walked it, despite the signs, but told us that the route was very narrow in parts. Vicki and I have no head for heights, and with us all having form for getting lost on mountainsides, we decided on discretion and walked up to Kingston, where we found a delightful pub (though the service was a little slow) and had puddings overlooking Corfe Castle. The Isle of Purbeck feels completely different from any of the previous places I have been. The countryside is more rolling and wooded and the architecture is gorgeous: houses of white Purbeck stone nestled into the valleys. I feel like I am in a quite different part of the country from Bournemouth, even though it is the same county. This feels like the South-West, rather than the South. See review for dinner recommendation. Made really good time today, and exceeded my plan for the weekend. Woke early after a very poor night’s sleep again. The hotel is by traffic lights on a busy secondary road, so all of the lorries heading for the port stop outside and the noise of them starting up is constant. I drove to Brockenhurst and left the car there, taking the train back down to Lymington where I had an indifferent breakfast in one of those places where the customers are clearly there just to clutter the place up – signs saying don’t do this and don’t do that everywhere. Started walking around 8.50 and was almost immediately back on the coast. The walk broke down into three parts. 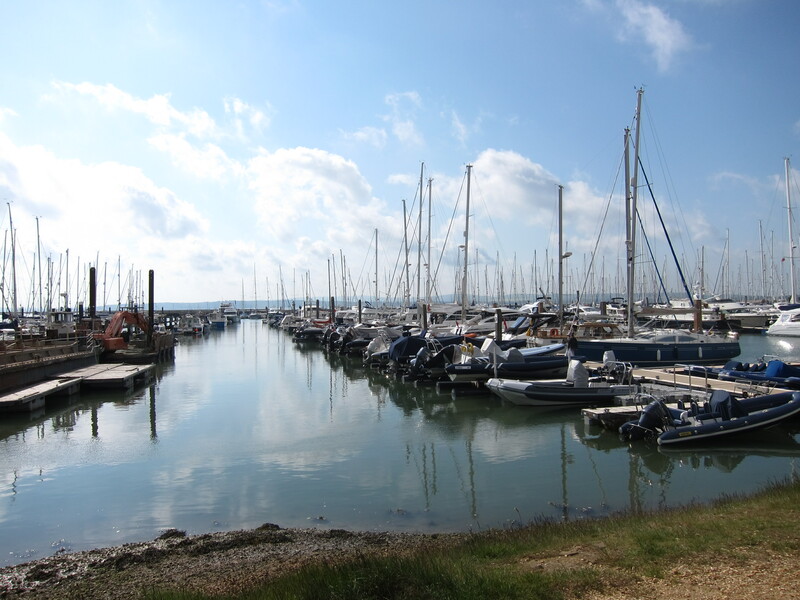 The first was the easy, flat walk from Lymington to Kesthaven, first through the marina then over the raised sea walls which surround the old salt works. Apparently, up until the 1850s, salt was a major production of the area. The sea water was trapped by sluices, then allowed to evaporate partially before the brine was pumped up and then dried out further. The railways brought cheap rock salt from Cheshire and negated the need for sea salt. The area is now a conservation and wild life reserve. I did very well with recognising new birds and spotted a shelduck and a white throat as well as the oyster-catchers coots, gulls and egrets I have previously seen. I also saw marsh marigolds in the wild for the first time. I raced along and arrived in Kesthaven before 11am, then another half hour down to the spit leading out to Hurst Castle. The Needles off the Isle of Wight were clearly visible. The second part of the walk was along the shingle from Milford on Sea (the end of the Solent Way) to the ferry at Mudebank. The shingle is very hard going, lots of undulations and it sinks underfoot. The cliffs have now turned a beautiful golden colour, and I was surprised, assuming this is sandstone, that the beach is still all stone. After Milford the shore was pretty quiet – at one point I was faced with either climbing over a rock fall or walking round through very choppy waters. I sat and contemplated it for a while, hoping that the tide would reveal more room to walk round, but after about 10 minutes it didn’t seem to be receding at all (although I knew from the tide tables that it should have begun to go out.) A walker from the opposite direction said the stone fall was fine, but, in the end, I tucked my map and camera in my rucksack, took off my boots and waded through. It was not especially cold, but quite rough and painful underfoot. I came out wet well above my knees, but the sun was shining and I soon dried out. 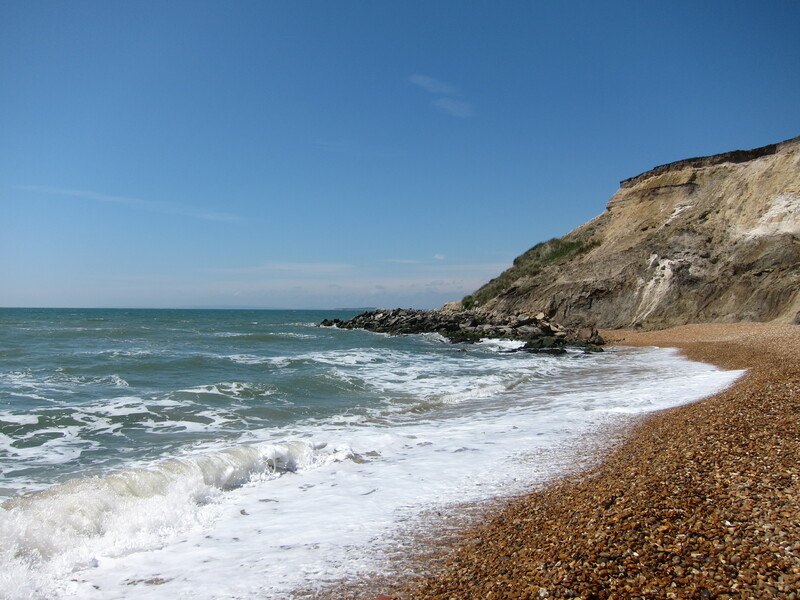 The seclusion of the beach was obviously welcome to another few Naturists, the real thing this time, clad only in shoes – you’d be mad to walk on the shingle without. I hope they had plenty of sun tan lotion on – the sun was fierce! Up over another rock pile – easier this time, onto a populated beach below Christchurch. 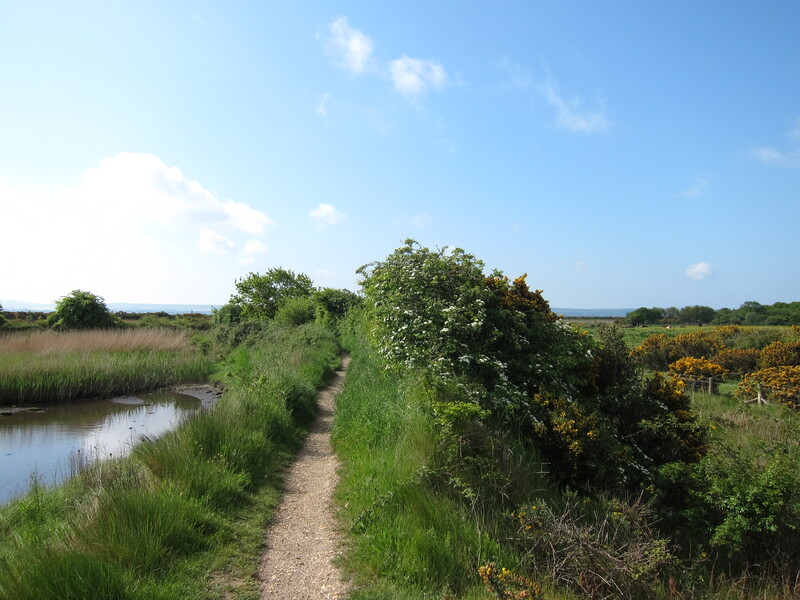 I marched along briskly, heading for the ferry at Mudeford across the The Run – the entrance to Christchurch Harbour. Just down by the ferry port there were literally dozens of people with their picnic chairs on the tarmac – don’t ask me why they didn’t walk a 100 yards to the beach! There were lots of people crabbing and an interesting pile of lobster pots. 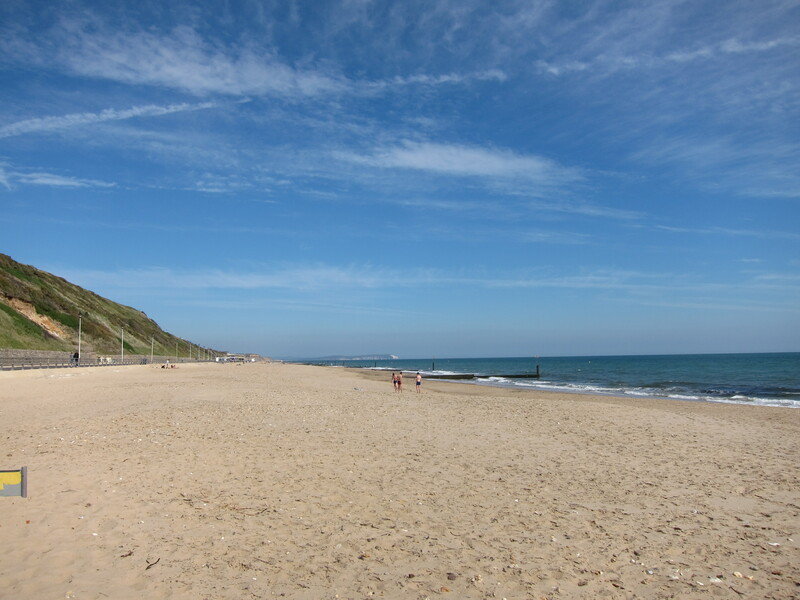 A ferry was arriving just as I did, and it cost me the princely sum of £1.30 to cross to Hengistbury Head and the delights, for the first time of a sandy beach! I took my boots off and danced along! In this third section of the day the sandy beach reaches around to the location of the Iron Age fort that was, according to the signs, the most important port in pre-Roman Britain. Eventually, I reached Bournemouth and took the steep staircase up to the town, to catch the train back to Brockenhurst. 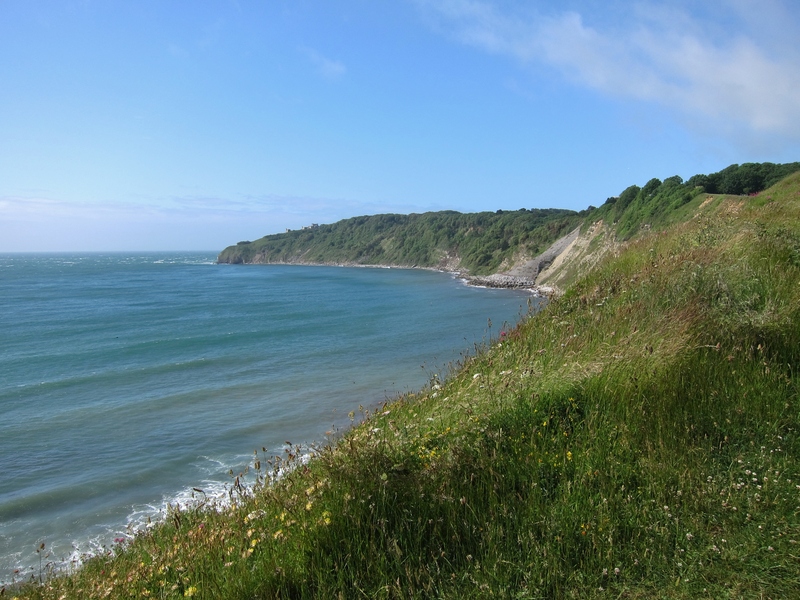 An excellent weekend – 60 miles with glorious weather.